Feb. 13 (Bloomberg) -- The Organization of Petroleum Exporting Countries cut its forecast for oil demand this year for a sixth straight month as the economic slump causes a “sudden and massive” drop in consumption. The estimate for 2009 global demand was lowered by 530,000 barrels a day to 85.13 million barrels a day, the producer group said in a monthly report today. Demand will contract by 580,000 barrels a day this year, or 0.7 percent. OPEC forecast a decline of 0.2 percent last month. Oil is down 23 percent this year and is more than $110 a barrel lower than a record high of $147.27 a barrel in July. The front-month March crude futures contract traded at $34.35 a barrel on the New York Mercantile Exchange at 9:03 a.m. The decline in global demand will be led by industrialized nations in North America, Europe and the Pacific rim, OPEC said. Consumption by developed economies will decline 1.13 million barrels a day in 2009, OPEC forecasts, a drop of 2.4 percent compared with 2008. This decrease will be partly offset by demand growth in developing economies, which OPEC forecasts to rise by 350,000 barrels a day, or 1.4 percent. Consumption of OPEC’s oil in 2009 will contract by 1.71 million barrels a day to 29.22 million barrels a day, the group said, calculating that figure using its world demand and non-OPEC supply forecasts. That level of demand is about 300,000 barrels a day less than it predicted last month. The Paris-based International Energy Agency also cut its global oil demand forecast for 2009 earlier this week, projecting consumption will drop by 1 million barrels to 84.7 million a day. Oil production by all 12 members of OPEC declined 959,200 barrels a day in January to 28.71 million barrels a day as the group enacted supply cuts, the report said, citing secondary- source estimates that include analysts and news agencies. The 11 OPEC members excluding Iraq pumped 26.33 million barrels a day in January. That is still above the production quota for this year of 24.85 million barrels a day, agreed by the group in December. The group will cut shipments by 3.5 percent in February, the biggest monthly reduction in at least five years, according to U.K.-based tanker-tracker Oil Movements. OPEC has completed about 60 to 70 percent of 4.2 million barrels a day of output reductions announced since September, the shipping consultant said. OPEC has complied with about 80 percent of cuts, Secretary-General Abdalla el-Badri said this week. Saudi output fell the most in January, dropping by 322,500 barrels a day, or 3.9 percent, to 7.99 million barrels a day, according to the OPEC report. The country has a production target this year of 8.05 million barrels a day. OPEC cut its forecast for oil supply from outside the group to 50.89 million barrels a day. That still leaves an increase of 550,000 barrels a day, or 1.1 percent, this year over 2008. Indonesia left the producer group this year. OPEC’s 12 remaining members are Algeria, Angola, Ecuador, Iran, Iraq, Kuwait, Libya, Nigeria, Qatar, Saudi Arabia, the United Arab Emirates and Venezuela. The benchmark crude price used by OPEC, derived from the cost of oil produced by each of its 12 members, averaged $41.52 a barrel in January and was at $41.79 yesterday, OPEC said it its report today. Feb. 13 (Bloomberg) -- Gold prices fell as demand for the precious metal eased after a three-day rally to the highest since July. Platinum also declined. The seven-day relative-strength index for gold topped 70 yesterday, a signal that prices are headed lower in the near term. Investment in the SPDR Gold Trust, the biggest exchange- traded fund backed by bullion, rose more than a 100 metric tons this week to a record 970.6 tons. Futures reached $954 an ounce yesterday, the highest since July 22. Gold futures for April delivery dropped $7, or 0.7 percent, to $942.20 an ounce on the Comex division of the New York Mercantile Exchange. The metal gained 3.1 percent this week. Gold will average $950 this quarter and $975 in the second quarter, Deutsche Bank said. Futures have averaged $880.87 in 2009. Holdings in the SPDR Gold Trust may soon exceed official reserves of Switzerland, the world’s sixth-largest stockpile. Investment in the ETF jumped 12 percent this week on demand for the metal as a store of value amid concern that the recession and banking crisis may deepen. Gold may ease to $910 to $915 over the next few sessions, Gartman said. A drop may signal a buying opportunity, some investors said. The U.S. has committed as much as $9.7 trillion to helping ease the recession and solve the banking crisis. Gold was the only precious metal to rally last year, gaining 5.5 percent. Silver futures for March delivery rose 11.5 cents, or 0.9 percent, to $13.625 an ounce today. Earlier, the price dropped as much as 2.1 percent. The metal gained 3.5 percent this week. Platinum futures for April delivery declined $16.90, or 1.6 percent, to $1,061 on the Nymex. Palladium futures for March delivery were unchanged at $216.50 an ounce. Earlier, the price dropped as much as 1.2 percent. This week, platinum jumped 5.6 percent, and palladium climbed 1.5 percent. Feb. 13 (Bloomberg) -- The yen and dollar recorded weekly gains against most of the other major currencies as concern U.S. plans to end the recession and the financial crisis will fall short spurred demand for havens. Japan’s currency and the dollar advanced more than 3 percent versus the South African rand and Swedish krona this week as a lack of detail in the U.S. Treasury’s financial recovery plan encouraged investors to repatriate funds. Finance ministers and central bankers of the Group of Seven major industrial nations said in a draft statement that “excess volatility and disorderly movements” in exchange rates should be avoided. The yen advanced 0.4 percent to 118.37 versus the euro this week from 118.85 on Feb. 6. It dropped 1.2 percent at 4:24 p.m. in New York, compared with yesterday. The dollar appreciated 0.5 percent to $1.2874 per euro from $1.2940, weakening 0.1 percent today. The dollar was little changed at 91.94 yen this week after increasing 1.1 percent today. Chile’s peso was one of the biggest gainers against the dollar today among the 177 currencies tracked by Bloomberg after the central bank cut the target lending rate yesterday by 2.5 percentage points to 4.75 percent, the sharpest reduction in at least a decade. The currency advanced as much as 3.4 percent to 573.92, the strongest level since Oct. 3. Russia’s ruble posted its biggest weekly rally against the dollar since December 1998 after Bank Rossii raised its interest rate on loans secured with bonds or other collateral through repurchase auctions twice in 10 weeks to force banks and companies to convert foreign currency. The ruble gained 4.4 percent to 34.5938 versus the dollar this week. G-7 officials will continue to monitor currency markets closely and cooperate as appropriate, finance ministers and central bankers meeting in Rome said in the draft statement. Since late October, when the G-7 expressed concern about the yen’s “excessive gains,” the currency climbed 0.9 percent. It appreciated 23 percent against the dollar in 2008, hurting overseas profits for such exporters as Toyota Motor Corp. The yen climbed 3.8 percent to 9.25 versus the South African rand and 3.4 percent to 10.96 against Sweden’s krona this week on speculation Japanese investors are selling higher-yielding assets and repatriating funds as the global recession deepens. Japan’s target lending rate of 0.1 percent compares with 10.5 percent in South Africa and 2 percent in Sweden. The U.S. House passed today a $787 billion economic stimulus plan designed to help repair the economy through tax cuts for businesses and families and a half-trillion dollars in federal spending. The chamber voted 246-183 for the measure with no Republicans in favor. The Senate plans to approve the package later today and send it to President Barack Obama for signing. Treasury Secretary Timothy Geithner, speaking on Feb. 11 before the Senate Budget Committee, defended his strategy of taking time to work out the details of a separate plan to shore up the financial industry. The dollar rallied 3.8 percent to 9.9370 South African rand and 3.6 percent to 8.3905 kronor this week as investors sought refuge in the world’s reserve currency. Coca-Cola Co., the largest soft-drink maker, said this week that the strong dollar reduced fourth-quarter profit, while PepsiCo Inc., the second-largest, said it raised prices to counter higher commodity costs and a gain in the greenback. The euro fell this week versus the dollar after the European Union’s statistics office said today gross domestic product in the 16-nation region decreased 1.5 percent, the most since euro- area GDP records began in 1995. The pound was poised for its first weekly loss against the dollar and euro since Jan. 23 after Bank of England Governor Mervyn King said this week that the economy is in a “deep recession” that may spur Bank of England policy makers to lower the 1 percent target lending rate further. Sterling dropped 2.3 percent to 89.60 pence per euro and 2.7 percent to $1.4394 this week after respective gains of 0.6 percent and 0.9 percent today. Investment in the SPDR Gold Trust, the biggest exchange- traded fund backed by bullion, reached a record 935.1 metric tons yesterday. A $789 billion stimulus plan moved toward passage in Congress, and U.S. Treasury Secretary Timothy Geithner has told lawmakers he needs more time to develop a $2 trillion plan to rescue banks. Gold has climbed 7.3 percent this year. Gold futures for April delivery rose $4.70, or 0.5 percent, to $949.20 an ounce on the Comex division of the New York Mercantile Exchange. Earlier, the price reached $954, the highest for a most-active contract since July 22. Silver futures for March delivery fell 1 cent to $13.51 an ounce. The metal fell 24 percent last year, while gold gained 5.5 percent. U.S. equities dropped, extending a global slump, after the government reported jobless claims rose to a record. Speculation that the government’s plan to revive the economy will fail also drove stocks lower. The Standard & Poor’s 500 Index is down more than 9 percent this year after tumbling 38 percent in 2008. Sales of 1-ounce American Eagle gold coins more than quadrupled in January to 92,000 ounces from a year earlier, the U.S. Mint said this week. The Mint sold 794,000 ounces of the coins in 2008, including 176,000 in December, the highest since January 1999. Yesterday, the coin cost $1,004.80 an ounce, almost $66 more than the spot price of gold. Still, gold’s gains were limited after rallying 5.8 percent in the previous two sessions. The seven-day relative-strength index topped 69 yesterday. A reading of 70 signals that prices may head lower in the near term. Earlier, futures dropped as much as $8. Feb. 12 (Bloomberg) -- Crude oil fell to the lowest close in more than seven weeks in New York on concern inventories will extend increases as demand drops. Supplies have gained in 18 of the past 20 weeks, leaving stockpiles the highest since July 2007, the Energy Department said. World oil consumption will drop 1.7 percent to 84.3 million barrels a day this year, consultant Wood Mackenzie said in a report today. The Energy Department and International Energy Agency cut their demand forecasts earlier this week. Crude oil for March delivery fell $1.96, or 5.5 percent, to $33.98 a barrel on the New York Mercantile Exchange, the lowest settlement since Dec. 19. It was the fifth consecutive daily decline. Oil is down 24 percent this year and 63 percent from a year ago. The discount of West Texas Intermediate, the grade that’s traded in New York, to London’s Brent widened to a record $10.67 a barrel today after supplies at Cushing, Oklahoma, rose. Brent increased after Royal Dutch Shell Plc said it may miss deliveries of oil from Nigeria because of security concerns. The oil for March settlement climbed 37 cents, or 0.8 percent, to $44.65 a barrel on London’s ICE Futures Europe exchange. March futures expired today. The more-active April contract gained 71 cents, or 1.6 percent, to close at $46.03 a barrel. Supplies at Cushing, where WTI is stored, climbed 1.7 percent to 34.9 million barrels last week, the highest since at least April 2004, when the department began keeping records for the location. “Cushing supplies have got to drop before we see the price of WTI recover,” said Adam Sieminski, the chief energy economist at Deutsche Bank AG in Washington. Prices for delivery in future months are higher than for earlier ones, a situation known as contango, allowing buyers to profit from hoarding oil. The price of oil for delivery in April is $8.19 a barrel higher than for March. December futures are up $19.89 from the front month. Futures touched $32.40 on Dec. 20, the lowest since February 2004. Traders rushed to sell January futures on that date because the contract expired at the end of the session. March futures in New York will expire on Feb. 20. Volume in electronic trading on the exchange was 648,177 contracts as of 3:16 p.m. in New York. Volume totaled 713,756 contracts yesterday, 39 percent higher than the average over the past three months. Open interest yesterday was 1.24 million contracts. The exchange has a one-business-day delay in reporting open interest and full volume data. The International Energy Agency yesterday reduced its global oil demand forecast for this year, projecting consumption will decline by 1 million barrels a day, the biggest drop since 1982. It’s the agency’s sixth consecutive reduction of its 2009 consumption estimate. President Barack Obama’s stimulus plan will be insufficient to avert the biggest U.S. economic decline since 1946 as consumer spending posts its longest slide on record, according to a monthly Bloomberg News survey. The world’s largest economy will contract 2 percent this year, half a percentage point more than last month’s forecast, according to the survey. The Organization of Petroleum Exporting Countries will cut shipments by 3.5 percent in February, the biggest monthly drop in at least five years, as the group implements a record production reduction to bolster prices, according to tanker-tracker Oil Movements. Crude oil prices won’t rebound to the $70 level until the OPEC production cuts are reflected in falling inventories, Ronald Brenneman, the chief executive officer of Petro-Canada, the country’s fourth-largest oil company, said in an interview in New York. Gasoline supplies fell as refineries shut units last week. Plants operated at 81.6 percent of capacity, down 1.9 percentage points from the prior week, and the lowest since the period ended Oct. 3 when the Gulf Coast was recovering from hurricanes Gustav and Ike, yesterday’s Energy Department report showed. Gasoline futures for March delivery declined 1.15 cents, or 0.9 percent, to settle at $1.2583 a gallon in New York. The average U.S. pump price for regular gasoline rose 1.2 cents to $1.952 a gallon, AAA, the nation’s largest motorist organization, said on its Web site today. Prices have declined 53 percent from the record $4.114 a gallon reached on July 17. Feb. 12 (Bloomberg) -- The dollar and gold will extend their gains on investor risk aversion as the precious metal departs from its correlation with crude oil, according to UBS AG. The U.S. currency in past years traded in the opposite direction of gold and crude oil. In 2009, the precious metal and oil diverged, with the dollar and gold rallying on demand for the safest assets while the global economic recession kept the price of petroleum low. The U.S. currencies will strengthen to $1.20 by the end of the year and gold will appreciate further as investors seek refuge from global economic turmoil, according to UBS. Gold rose 5.5 percent last year, trading at $947.40 today, while crude dropped 54 percent in 2008, reaching $33.94 a barrel today. The dollar traded at $1.2823 per euro after appreciating 4.4 percent last year. The U.S. will push its counterparts in the Group of Seven major industrial nations to take bold measures to combat the global economic downturn at a meeting at the end of this week, a Treasury official said today. Feb. 13 (Bloomberg) -- The dollar may rise for a fourth day against the euro, the longest gain in four months, on speculation U.S. plans to end the recession will fall short, spurring demand for the greenback as haven. The euro fell yesterday to the lowest level versus the dollar in more than a week as industrial output in the 16 countries sharing the currency dropped in December by the most on record, giving the European Central Bank more room to cut interest rates. The Group of Seven major industrial nations may discuss exchange rates during a meeting that starts today. The dollar traded at $1.2866 per euro at 8:44 a.m. in Tokyo from $1.2861 late in New York yesterday, when the greenback touched $1.2722, the strongest level since Feb. 2. The yen traded at 116.67 per euro from 116.95 late in New York yesterday. The U.S. currency traded at 90.82 yen from 90.94 yen. Traders may have bought the euro at about $1.27 to keep it from falling below that level so they can profit from an options contract that expires today, said Scott Ainsbury, a portfolio manager who helps manage about $12 billion in currencies at New York-based hedge fund FX Concepts Inc.
“The bottom side, the $1.27, is acting as a magnet,” Ainsbury said of the euro versus the dollar. “It has just been held up almost artificially.” The euro hasn’t fallen below $1.27 since Dec. 5. An option grants an investor the right, not the obligation, to buy or sell the underlying security at a pre- determined date. Sterling fell 1.3 percent to $1.4218 and 0.6 percent to 90.18 pence per euro yesterday as the spread between two- and 10- year government debt reached the widest since at least 1992. Bank of England Governor Mervyn King said on Feb. 11 the U.K. is in a “deep recession” that may prompt policy makers to keep cutting the main rate, now at 1 percent, and pump money into the economy. The yen advanced 1.5 percent to 13.1741 versus the Norwegian krone and 1 percent to 129.02 versus the pound yesterday on speculation the global drop in stocks will encourage investors to sell higher-yielding assets and pay back low-cost loans in Japan. Japan’s 0.1 percent target lending rate compares with 1 percent in Great Britain and 2.5 percent in Norway. The South African rand depreciated 3 percent to 10.1096 per dollar on speculation the country’s credit rating may be downgraded as the government plans to more than double its fiscal deficit because of slowing economic growth. The G-7 plans to discuss exchange-rate developments at a meeting in Rome today and tomorrow, a U.S. Treasury official on Feb. 11. told reporters in Washington on condition of anonymity, declining to discuss specific currencies. Treasury Secretary Timothy Geithner, speaking on Feb. 11 before the Senate Budget Committee, defended his strategy of taking time to work out the details of a plan to shore up the financial industry. A U.S. economic stimulus bill was headed for passage in Congress by the end of this week after lawmakers agreed on a $789 billion plan that aims to stem the recession through a mix of government spending and tax cuts. The euro weakened yesterday as much as 1.4 percent against the dollar after the European Union’s statistics office said in Luxembourg that industrial output fell 12 percent from a year earlier. The decline was larger than the 9.5 percent drop forecast by economists in a Bloomberg survey and the biggest since the data series began in 1986. The ECB cut its inflation outlook in 2010 to 1.6 percent from 2 percent, stoking speculation policy makers will lower its main refinancing rate to a record. The bank also reduced its 2010 growth outlook to 0.6 percent from 1.4 percent. Investors added to bets the ECB will reduce the 2 percent rate at its March 5 meeting, with the yield on the three-month Euribor interest rate futures contract due in March falling to 1.70 percent yesterday. FCPO 3rd month April Futures contract close marginally RM3 higher as compare to previous trading session with 5867 lots traded in the market. CPO price seems to traded sideways throughout the entire trading session despite wild movement in soybean oil and crude oil price movement. Technically, CPO price was seen consolidating around RM1900 and RM1960 range. 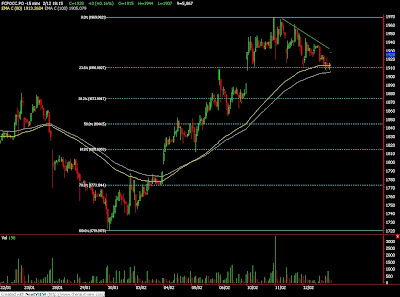 However, 15minute and hourly CPO price chart shows a falling wedges where support seen at RM1910 regions. Traders were advice to hold long position once the resistance levels at RM1940 and RM1960 were violated. Support levels were seen at RM1910 and RM1840 region. FKLI February futures contract plunge 12 points lower to close 880.5 as compare to previous trading session with total 6701 lots traded in the market. FKLI was traded lower throughout the entire trading session due to weak Dow Jones futures electronic trading. 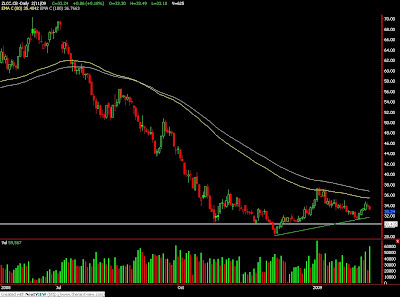 Technically, FKLI seem to correct further lower to test support levels at 880 regions. A falling wedge was seen in the FKLI hourly chart where support seen at 880 region. We expect FKLI would break up from the falling in the coming trading session. Traders were advice to hold long position in the coming trading session while being cautious around resistance levels at 888 and 896. Feb. 12 (Bloomberg) -- The yen rose against the dollar and the euro as stocks declined on concern U.S. government efforts will fail to revive bank lending, boosting demand for Japan’s currency as protection against the financial-market turmoil. The euro also fell for a third day against the yen on speculation a report today will show industrial output in the 16- nation region slid the most in almost 23 years, giving the central bank more reason to cut interest rates. The dollar weakened against the yen for a fourth day before U.S. data that economists say will show the number of Americans filing first- time jobless claims remained near a 26-year high. The yen strengthened to 89.94 per dollar as of 9:16 a.m. in London, from 90.40 in New York yesterday, when it reached 89.71, the strongest since Feb. 5. It appreciated to 115.63 per euro from 116.66. The dollar was at $1.2851 per euro from $1.2906. The MSCI World Index dropped a third day, losing 0.8 percent, and Europe’s Dow Jones Stoxx 600 Index declined 1.6 percent. U.S. stock futures fell. “The stock market is a barometer of risk aversion, with losses serving as a positive lead for the yen,” said Takashi Kudo, director of foreign-exchange sales in Tokyo at NTT SmartTrade Inc., a unit of Nippon Telegraph & Telephone Corp., Japan’s largest fixed-line telephone company. U.S. Treasury Secretary Timothy Geithner, speaking yesterday before the Senate Budget Committee, defended his strategy of taking time to work out the details of a plan to shore up the financial industry. As many as 610,000 Americans made initial applications for unemployment benefits in the week ended Feb. 8, following 626,000 the previous week, according to the median estimate of 45 economists’ forecasts in a Bloomberg News survey. The Labor Department will release the data at 8:30 a.m. in Washington. The U.S. jobless rate climbed to 7.6 percent in January, the highest level since 1992, and payrolls fell 598,000 last month, the biggest decline since December 1974, the Labor Department said last week. U.S. lawmakers yesterday agreed on a $789 billion economic stimulus plan, trimming the measure from more than $800 billion. Congress will send the stimulus package to President Barack Obama as early as today, Senate Majority Leader Harry Reid said yesterday. Industrial output in the European Union may have declined 9.5 percent in December from a year earlier, the most since Bloomberg began compiling the data in January 1986, according to a separate survey of 19 economists. The region’s statistics office releases the report at 11 a.m. in Luxembourg. The euro declined against the dollar as the European Central Bank cut its inflation outlook in 2010 to 1.6 percent from 2 percent, stoking speculation policy makers will lower its main refinancing rate to a record. The bank also reduced its 2010 growth outlook to 0.6 percent from 1.4 percent. “The report may heighten expectations for an ECB rate reduction,” said Masanobu Ishikawa, general manager of foreign exchange at Tokyo Forex & Ueda Harlow Ltd., Japan’s largest currency broker. “The euro is likely to weaken further” to $1.2830 and 115.90 yen today, he said. Investors added to bets the ECB will lower borrowing costs from 2 percent at its March 5 meeting. The yield on the three- month Euribor interest rate futures contract due in March fell to 1.70 percent today from 1.715 percent yesterday. ECB council member Erkki Liikanen said policy makers may cut the rate at their March meeting, Helsinki-based financial news Web site Taloussanomat.fi reported. The Group of Seven industrialized nations will meet this weekend in Rome to discuss measures to stabilize the financial system, with finance ministers and central bankers likely to seek assurances the global recession won’t spark a wave of protectionism that deepens the slump, according to Marco Annunziata, chief economist at UniCredit MIB in London. The G-7 may reinstate a call for China to increase the flexibility of its currency, Makoto Utsumi, a former top currency official at Japan’s Finance Ministry, said last week. “The yuan may be singled out,” he said. Feb. 12 (Bloomberg) -- India, the world’s biggest buyer of vegetable oils after China, imported 87 percent more cooking oil last month after a decline in palm oil prices boosted demand. Edible oil purchases in January were 856,690 tons, up from 457,601 tons a year ago, the Solvent Extractors’ Association of India said in a statement today. Imports in the three months to January almost doubled to 2.09 million tons from a year ago. Increased purchases may help support palm oil prices that slumped 44 percent last year in Malaysia, the world’s second- biggest producer. Imports may climb to as much as 6.5 million metric tons from 5.7 million tons a year ago, Govindlal G. Patel, director of Dipak Enterprises, said yesterday. Palm oil futures for April delivery climbed as much as 1 percent to 1,945 ringgit ($538) a ton in Kuala Lumpur. Futures were at 1,934 ringgit at 4 p.m. local time. India bought more palm oil in anticipation of an increase in the import tax and lower edible oil prices, the association said. Purchases in January totaled 703,515 tons, taking the season’s total to 1.84 million tons, or 88 percent of the total. The country won’t impose a tax on crude palm oil imports as prices of domestic oilseeds are above the assured rates paid to farmers by the government, Farm Minister Sharad Pawar said last month. India imposed a 20 percent import duty on crude soybean oil in November to shield oilseed growers from purchases made at zero duty. No duty was levied on crude palm oil. Vegetable oil imports, including the non-edible grades, were 912,342 tons in January, the highest since India freed imports in 1994, the association said today. Purchases between November and January jumped 78 percent to 2.2 million tons. India bought 124,118 tons of sunflower oil in November-to- January period after the commodity cheaper than soybean oil, the extractors’ group said. The nation also imported 1,914 tons of rapeseed oil for the first time since the 2002-03 season. India relies on overseas purchases to meet almost half its edible-oil demand. It buys palm oil from Indonesia and Malaysia, and soybean oil from Argentina and Brazil. NEW DELHI, Feb 12 (Reuters) - India's vegetable oil imports rose 78 percent in January as low global prices and expectations of a higher import tax lifted purchases to the highest since trade rules were eased 15 years ago, a leading trade body said. This has hurt domestic Industry in India, the world's biggest vegetable oil importer after china, during peak crushing season, B.V. Mehta, executive director of the Solvent Extractors' Association said on Thursday. "Most of the plants are currently running on marginal or negative margin affecting overall crushing and availability of domestic oils," he said. Traders said Argentine soyoil prices stood at $700 per tonne, free on board, a discount of $85 to domestic rates. January imports of vegetable oils amounted to 912,342 tonnes, which includes 856,690 tonnes of edible oils. Imports in the first three months of the season that began in November rose 77.5 percent to 2.2 million tonnes, the trade body said in a statement. India in 2008 slapped an import tax of 20 percent on crude soyoil but decided to continue its zero import tax on crude palm oil as it accounted for almost 90 percent of the country's total vegetable oil imports. Feb. 12 (Bloomberg) -- Malaysia’s exports fell the most in almost seven years in December as electronics and commodities sales slid amid dwindling global orders. Overseas shipments dropped 14.9 percent from a year earlier to 46.1 billion ringgit ($12.8 billion) after slipping 4.9 percent in November, the trade ministry said in a statement in Kuala Lumpur today. The median estimate in a Bloomberg News survey of 13 economists had been for a 9 percent decline. Exports by Malaysia and its neighbors have “weakened notably in recent months in the face of the collapse in global demand,” said David Cohen, director of Asian forecasting at Action Economics in Singapore. Malaysia expects 2009 growth to slow to an eight-year low as the global recession hurts demand for made-in-Asia products such as Dell Inc. computers and Intel Corp. chips. Industrial output slumped 15.6 percent in December, a report yesterday showed, adding pressure on the government to boost spending as the central bank said it won’t cut interest rates further. Bank Negara Malaysia will keep its key interest rate unchanged for now as priority is given to providing credit to businesses and consumers, Governor Zeti Akhtar Aziz said yesterday. The central bank in January cut the benchmark by three-quarters of a percentage point to 2.5 percent, the biggest reduction in borrowing costs in more than a decade. The government is planning a second economic stimulus package after announcing spending worth 7 billion ringgit in November. The second plan may result in a wider budget deficit than the 4.8 percent of gross domestic product estimated earlier, Deputy Prime Minister Najib Razak said Jan. 29. Asia’s export-dependent economies including Taiwan and South Korea have posted record declines in shipments abroad. Singapore, Japan and the U.S., Malaysia’s biggest overseas markets, are all in recession. Malaysia’s exports to the U.S. dropped 30 percent to 5.5 billion ringgit in December from a year earlier amid a decline in electrical and electronics shipments, the ministry said today. Shipments of electrical and electronics goods, which made up 37 percent of total exports in December, slid 26 percent from a year earlier. Palm oil sales abroad fell 6.1 percent in December as prices eased from record highs reached earlier last year. Malaysia is Southeast Asia’s second-largest oil and gas producer and the world’s No. 2 palm oil seller. Imports dropped 23.1 percent in December to 34.4 billion ringgit, leaving a trade surplus of 11.7 billion ringgit. Exports grew 9.6 percent in 2008, while imports expanded 3.3 percent, leaving a trade surplus of 142 billion ringgit. Inverted head and shoulder was spotted in Soybean Oil daily chart. Current support seen at USD33.00 and USD32.60, both were 50% and 61.8% Fibonacci figure. Previous lower was seen at USD 31.23 while resistance for pattern confirmation at USD 37.00 regions. Feb. 11 (Bloomberg) -- The International Energy Agency cut its global oil demand forecast for 2009, projecting consumption will decline by 1 million barrels a day as the worldwide recession deepens, the biggest drop since 1982. Oil prices have plunged more than $100 a barrel from a record in July as the U.S., Europe and Japan face their first simultaneous recession since World War II. Crude futures in New York traded below $40 a barrel today. It’s the agency’s sixth consecutive reduction of its 2009 crude demand estimate, now forecast to shrink 1.1 percent from 2008. The biggest revision was made to the world’s most developed economies in the Organization for Economic Cooperation and Development. The IEA cut demand expectations there 340,000 barrels a day to 46 million barrels a day, implying a contraction of 1.5 million barrels a day, or 3.2 percent. Estimates for oil consumption this year among developing nations were lowered by 230,000 barrels a day to 38.7 million a day, with the outlook for Asia and the former Soviet Union “particularly grim,” it said. The IEA trimmed its forecast for supplies from outside the Organization of Petroleum Exporting Countries next year by 110,000 barrels a day to 50.9 million barrels a day. The total now includes 1 million barrels a day from Indonesia, which left OPEC at the start of the year. “There’s a real risk that supply takes a hit this year because of lower prices and scant credit,” Fyfe said. OPEC, responsible for more than 40 percent of the world’s oil, will have to provide about 28.8 million barrels a day this year to balance supply and demand, the IEA said. Its 12 members pumped 29 million barrels a day of crude oil in January, 950,000 barrels a day less than in December, as the organization implemented announced supply cuts, the IEA said. Saudi Arabia, OPEC’s biggest producer, cut by 300,000 barrels a day last month to 8.1 million barrels a day, according to the agency. The 11 OPEC nations bound by production quotas pumped 26.65 million barrels a day last month, the IEA said, compared with their official Jan. 1 limit of 24.845 million a day. The IEA has reduced its estimate for OPEC’s average capacity this year to 35.1 million barrels a day from 35.5 million a day in July, when prices reached a record $147.27 a barrel. Feb. 12 (Bloomberg) -- Crude oil traded near $36 a barrel after dropping yesterday to its lowest in four weeks as a U.S. government report showed a bigger-than-forecast increase in inventories. Supplies rose 4.72 million barrels to 350.8 million barrels last week, the Energy Department said. Stockpiles were forecast to climb by 2.75 million barrels, according to a Bloomberg News survey. Prices for delivery in future months are higher than for earlier ones, a situation known as contango, allowing buyers to profit from hoarding oil. Crude oil for March delivery rose 19 cents, or 0.5 percent, to $36.13 a barrel at 10:48 a.m. Sydney time on the New York Mercantile Exchange. Yesterday, oil fell $1.61, or 4.3 percent, to $35.94 a barrel in New York , the lowest settlement since Jan. 15. Oil is down 19 percent this year and 62 percent from a year ago. The price of oil for delivery in April is $6.43 a barrel higher than for March. December futures are up $17.75 from the front month. Crude oil inventories have gained in 18 of the past 20 weeks, leaving stockpiles 16 percent higher than the five-year average for the period, the department said yesterday. Supplies at Cushing, Oklahoma, where oil traded on Nymex is stored, climbed 1.7 percent to 34.9 million barrels last week, the highest since at least April 2004, when the department began keeping records for the location. Gasoline inventories fell 2.66 million barrels to 217.6 million, the biggest drop since September. A 500,000 barrel increase was forecast, according to the median of 15 analyst responses in the Bloomberg News survey. Gasoline futures for March delivery climbed 2.59 cents, or 2.1 percent, to $1.2698 a gallon in New York yesterday. U.S. refineries operated at 81.6 percent of capacity last week, down 1.9 percentage points from the prior week, and the lowest since the period ended Oct. 3 when the Gulf Coast was recovering from hurricanes Gustav and Ike, the report showed. Analysts forecast that there would be no change. Companies often shut refinery units for maintenance in January and February as attention shifts away from heating oil and before gasoline use rises. The average U.S. pump price for regular gasoline rose 1.2 cents to $1.94 a gallon, AAA, the nation’s largest motorist organization, said on its Web site yesterday. Prices have declined 53 percent from the record $4.114 a gallon reached on July 17. The Organization of Petroleum Exporting Countries pumped 29 million barrels a day of crude oil in January, 950,000 barrels less than in December, as the 12-member group implemented previously announced supply cuts, the International Energy Agency said in its monthly report. The group may decide on a fourth supply reduction in six months to halt the plunge in oil prices and encourage oilfield investment when ministers gather for their next scheduled meeting March 15 in Vienna. “The inventory numbers show that there’s a lot of excess oil supply on the market despite OPEC production cuts and the possibility for further ones,” said Rachel Ziemba, an analyst at RGE Monitor, an economic research company in New York. Brent crude oil for March settlement fell 33 cents, or 0.7 percent, to end the session at $44.28 a barrel on London’s ICE Futures Europe exchange yesterday. Brent futures were at a $8.34 premium over West Texas Intermediate, the grade that’s traded in New York. The IEA, in its report yesterday, cut its global oil-demand forecast for 2009, projecting consumption will decline by 1 million barrels a day as the global economic slowdown deepens, the biggest drop since 1982. The IEA, which advises 28 developed nations on energy policy, trimmed its 2009 forecast by 570,000 barrels from last month to 84.7 million a day because of a weaker outlook from the International Monetary Fund. Feb. 12 (Bloomberg) -- The dollar and yen may gain against the euro as a lack of detail in Treasury Secretary Timothy Geithner’s bank rescue plan increases demand for the currencies as havens from financial turmoil. The Swedish krona and the pound were the biggest losers yesterday against the dollar among the major currencies after the Riksbank lowered borrowing costs more than forecast and Bank of England Governor Mervyn King said the economy is in a deep recession. The dollar and yen pared gains on bets Congress will send a $789 billion economic stimulus package to President Barack Obama by the end of this week. The dollar rose to $1.2884 per euro at 8:48 a.m. in Tokyo from $1.2906 late in New York yesterday. The yen gained to 116.36 per euro from 116.66. The dollar was at 90.35 yen from 90.40 yen. Sterling slid 0.02 percent to 89.67 pence per euro and lost 0.2 percent to $1.4363 as King said at a press conference in London yesterday that the slumping British economy may force policy makers to create money after cutting the target lending rate to a record low of 1 percent. The number of people in the U.K. receiving jobless benefits rose in January to 1.23 million, the most since July 1999, the Office for National Statistics said yesterday. Sweden’s krona lost 1.3 percent to 10.7917 per euro and 1.4 percent to 8.3701 versus the dollar after the central bank lowered the benchmark interest rate to 1 percent and signaled further reductions to revive lending. The median forecast of 20 economists surveyed by Bloomberg News was for a cut of a half- percentage point. The yen appreciated 0.2 percent to 78.08 against the Swiss franc on speculation financial turmoil will encourage investors to sell higher-yielding assets and pay back low-cost loans in Japan. The Bank of Japan’s target lending rate of 0.1 percent compares with 0.5 percent in Switzerland. Geithner, speaking yesterday before the Senate Budget Committee, defended his strategy of taking time to work out the details of his plan to shore up the financial industry. U.S. lawmakers are cutting a proposed economic stimulus package to $789 billion and may be able to send it to Obama by the end of this week, said Senate Finance Committee Chairman Max Baucus. The Brazilian real was yesterday’s biggest gainer versus the dollar among the major currencies as the central bank offered dollar loans to exporters and gauged demand for currency-swap contracts to shore up the currency. The real advanced 1.8 percent to 2.2692 versus the dollar. The euro declined early yesterday against the yen after a European Central Bank policy maker signaled the main refinancing rate may be cut below 2 percent. ECB Executive Board Member Jose Manuel Gonzalez-Paramo said in an interview on Spain’s Radio Intereconomia that the current rate isn’t the lowest that policy makers can envisage. FCPO 3rd month April Futures contract fall RM44 lower to close RM1925 as compare to previous trading session with 11714 lots traded in the market. Heavy profit taking activities were take place in CPO price trading session due to weak soybean oil electronic trading. RM1960 range. 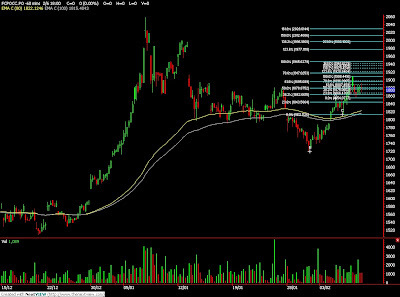 Hourly chart shows weak volume transaction every time CPO price attempt to break up higher. However, we expect CPO price would encounter great buying pressure around RM1840 and RM1800. Traders were advice to hold long position around the support levels while be cautious around resistance at RM1970 and RM2000 regions. FKLI February futures contract fall 7.5 points lower to close 892.5 as compare to previous trading session with total 4149 lots traded in the market. FKLI was traded lower and sideways as overnight Dow Jones and regional indices were traded weak during trading session. 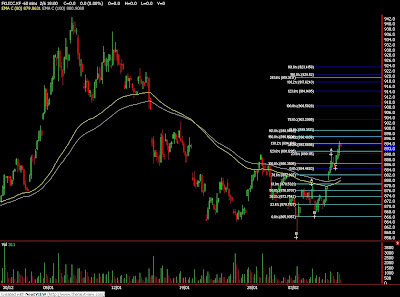 Technically, FKLI seems temporary supported above 887; 38.1% Fibonacci retrace figure. FKLI hourly chart seems price was traded within downtrend channel. 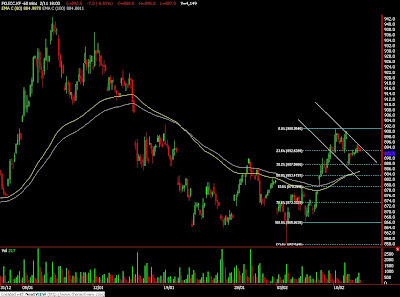 However, we expect FKLI would trade higher in the coming trading session with in support seen at 883 and 880 regions. Traders were advice to hold long position while being cautious around resistance levels seen at 900 and 913 regions. MUMBAI, Feb 11 (Reuters) - Indian soyoil futures fell on Wednesday afternoon, tracking losses in Malaysian palm markets and with edible oil supplies due to rise as local oilseed crops are harvested and crushed. By 2:20 p.m. (0850 GMT), the March futures NSOH9 contract was down 1.40 percent at 451.1 rupees ($9.3) per 10 kg on the National Commodity and Derivatives Exchange. The February contract NSOG9, which expires on Feb. 20, had fallen 1.01 percent to 461.55 rupees. Arrivals of rapeseed, India's main winter-grown oilseed, are picking up and crushing would soon release extra supplies of oil into the open market, analysts said. "Weak local demand and falls in the global markets are putting pressure on the prices," Veeresh Hiremath, an analyst in Karvy Comtrade Ltd, added. Weak Malaysian palm oil market and losses in U.S. soyoil futures weighed on markets. MUMBAI, Feb 11 (Reuters) - India soybean futures are likely to open down on Wednesday tailing overseas markets that were down on forecasted rain in third-biggest exporter Argentina and a sharp drop in crude oil prices, analysts said. U.S. crude oil futures fell 5 percent on Tuesday, settling below $38. U.S. soy for March delivery SH9 also dropped 0.4 percent to $9.89-¾ per bushel after falling 8 cents a day earlier. At 9:35 a.m., the benchmark palm oil April contract KPOc3 on the Bursa Malaysia Derivatives Exchange was down 0.71 percent at 1,955 ringgit a tonne. The March soybean contract NSBH9 on National Commodity and Derivatives Exchange ended at 2,391.5 rupees per 100 kg, up 0.50 percent in the previous session. FCPO 3rd month April Futures contract surge RM89 higher to close RM1969 as compare to previous trading session with 9823 lots traded in the market. CPO price was mainly traded sideways before start to surge up before market about to close. Technically, CPO price was consolidating during earlier trading session but starts to surge up soon resistance level at RM1950 was breach. We expect CPO price would continue to trade higher in the coming trading session. Traders were advice to hold long position in the coming trading while being cautious around resistance levels at RM1970 and RM2050 region. Temporary support was seen at RM1900 and RM1850 region. FKLI February futures contract surge another 7 points higher to close 900 as compare to previous trading session with total 5228 lots traded in the market. Profit taking activities held in earlier trading session and FKLI continue to surge up before market about to close. Technically, FKLI seems complete correction at 892 which is 23.6% Fibonacci retracement level. We expect FKLI would trade higher in the coming trading session provided if support levels at 892 and 880 were not violated. Traders were advice to hold long position in the coming trading while be cautious around resistance levels at 913 and 927 region. Feb. 10 (Bloomberg) -- The U.S. reduced its forecasts for crude oil and natural-gas consumption this year as the global economic slowdown cuts fuel purchases. World oil demand will average 84.7 million barrels a day, down 400,000 barrels, or 0.5 percent, from a forecast in January, the Energy Department said today in its Short-Term Energy Outlook. The estimate is down 1.17 million barrels from demand last year. Natural-gas consumption will decline 1.3 percent as factory owners shut plants in the deepening recession. “The report reflects the economy, which is still getting a little weaker,” said Tancred Lidderdale, a government economist in Washington who supervised the monthly outlook. U.S. oil demand will average 19.02 million barrels a day in 2009, down 460,000 barrels a day from 2008. The forecast was reduced by 100,000 barrels from last month’s report. West Texas Intermediate crude oil, the U.S. benchmark, will average $43.14 a barrel in 2009, down from $43.25 estimated in January, the report from the department’s Energy Information Administration showed. Oil averaged $99.57 a barrel in 2008, according to the report. Regular gasoline at the pump, averaged nationwide, will cost $1.95 a gallon this year, up 4.3 percent from $1.87 estimated in the January report. The average price last year was $3.25. The fuel will average $2.19 a gallon next year. The government raised its estimate of winter fuel costs from last month. The heating season runs from October through March. Heating oil users will spend an average $1,606 this winter, up 5 percent from $1,530 forecast last month and 18 percent lower than the average $1,953 spent by households last winter. Homeowners using natural gas will see average heating costs for the season of $870, up 3.7 percent from $839 forecast in January. The estimate is up 1.4 percent from an average $858 last winter, the report showed. The 1.3 percent drop in U.S. natural gas consumption this year will take demand to an average 62.7 billion cubic feet a day. The drop was estimated at 1 percent last month. Industrial gas demand will probably fall 5.1 percent to 17.3 billion cubic feet a day, and power generation use may fall 1 percent to 18 billion. The decline in industrial demand was greater than the 3 percent drop estimated in the January report. Gas production in the U.S. may increase to 58.7 billion cubic feet a day this year from 58.6 billion in 2008. Output was estimated at 58.9 billion cubic feet a day in the January report. Feb. 10 (Bloomberg) -- Gold rose the most in a week on concern that U.S. government plans to revive credit markets and ease the recession will stoke inflation, boosting the appeal of the metal as a hedge. Silver also gained. The government may spend as much as $1 trillion to rescue banks, Treasury Secretary Timothy Geithner said in a speech today in Washington. The Senate passed an $838 billion stimulus bill, moving it toward final congressional action. Investment in the SPDR Gold Trust, the biggest exchange-traded fund backed by bullion, reached a record 881.9 metric tons yesterday. Gold futures for April delivery rose $21.40, or 2.4 percent, to $914.20 an ounce on the Comex division of the New York Mercantile Exchange, the biggest gain for a most-active contract since Jan. 30. Gold for immediate delivery in London rose $22.21, or 2.5 percent, to $916.76 an ounce at 3:37 p.m. New York time. Silver futures for March delivery rose 30 cents, or 2.3 percent, to $13.13 an ounce on Comex. The price has gained 16 percent this year, while gold is up 3.4 percent. “We are exploring a range of different structures for this program, and will seek input from market participants and the public as we design it,” Geithner said in the speech about a separate lending plan to be set up with the Federal Reserve and the Federal Deposit Insurance Corp.
“This program should ultimately provide up to $1 trillion in financing capacity, but we plan to start it on a scale of $500 billion, and expand it based on what works,” Geithner said in a prepared text for the speech. Should a stimulus plan valued at about $800 billion become law, the U.S. will have committed $9.7 trillion to solving the financial crisis. “Clearly, as far as those who would like investors to load up on precious metals are concerned, the program has but one outcome: inflation; coming soon, and coming in spades.” said Jon Nadler, a senior analyst at Kitco Inc. in Montreal. Falling asset prices may limit gold’s gains, Nadler said. Since the second quarter of 2007, banks worldwide have posted more than $1 trillion in credit losses and writedowns related to the financial crisis. Gold reached a record $1,033.90 an ounce on March 17. Speculators have placed bets that gold may top $1,000 by April, open interest in Comex options indicates. Still, gold may face resistance around $925 to $930 as the highest prices since October attract sellers, said Dennis Gartman, an economist and the editor of the Gartman Letter in Suffolk, Virginia. Gold reached $931.30 on Jan. 30, the highest since Oct. 10. Gold imports into Dubai rose 21 percent to 674 metric tons in 2008 from 559 tons, the Dubai Multi Commodities Centre said yesterday in a statement. “We anticipate that imports into Dubai, destined for refining and re-export, will continue to perform solidly,” David Rutledge, chief executive officer of DMCC, said in the statement. Global scrap supply grew 13 percent to 1,108 metric tons in 2008, according to London-based researcher GFMS Ltd. The Middle East saw the biggest increase, with supplies rising 27 percent to 364 tons from a year earlier. Feb. 10 (Bloomberg) -- Crude oil fell to a three-week low on skepticism that the U.S. government’s bank rescue plan will revive the economy. Oil dropped as much as 5.6 percent after Treasury Secretary Timothy Geithner said he is “exploring a range of different structures” to bail out lenders. A U.S. government report tomorrow is forecast to show that crude oil stockpiles increased 2.75 million barrels last week, according to the median of 14 analyst estimates in a Bloomberg News survey. Crude oil for March delivery fell $2.01, or 5.1 percent, to $37.55 a barrel at 2:57 p.m. on the New York Mercantile Exchange, the lowest settlement since Jan. 16. It was the biggest decline since Jan. 27. Prices gained as much as $2.24, or 5.7 percent, before Geithner spoke. Oil is down 16 percent this year and has declined 60 percent from a year ago. Geithner pledged government financing for programs aimed at spurring new lending and addressing banks’ toxic assets, an effort that may grow to as much as $2 trillion. The Standard & Poor’s 500 Index dropped 4.9 percent to 827.16 and lost as much as 5.4 percent, the most since Jan. 20. The U.S. Senate approved an $838 billion economic stimulus package, clearing the way for negotiations with the House over a compromise plan lawmakers said they want to send to President Barack Obama quickly. “It’s become clear that nobody knows what’s going to work to get us out of this mess,” Fitzpatrick said. The price of oil for delivery in April is $6.21 a barrel higher than the March contract. December futures are up $16.20 from the front month. This structure, in which the future month’s price is higher than the one before it, is known as contango, and is often an indicator of oversupply. Gasoline stockpiles rose 500,000 barrels from 220.2 million in the week ended Feb. 6, according to the Bloomberg News survey. The Energy Department is scheduled to release its weekly inventory report tomorrow at 10:30 a.m. in Washington. Gasoline futures for March delivery declined 0.32 cent, or 0.3 percent, to settle at $1.2439 a gallon in New York. Heating oil dropped 5.09 cents, or 3.8 percent, to end the session at $1.3014. The industry-funded American Petroleum Institute reported that U.S. supplies declined 2 million barrels to 344.3 million last week. The API published its weekly report on oil inventories at 4:30 p.m. in Washington today. Kuwait will monitor oil market conditions before deciding whether to support a reduction in supply by the Organization of Petroleum Exporting Countries when ministers meet in Vienna on March 15, newly appointed Oil Minister Sheikh Ahmed al-Abdullah al-Sabah told reporters in parliament today. Brent crude oil for March settlement fell $1.41, or 3.1 percent, to end the session at $44.61 a barrel on London’s ICE Futures Europe exchange. Brent futures closed at a $7.06 premium to West Texas Intermediate, the grade that’s traded in New York. Global oil demand will average 84.7 million barrels a day this year, down 1.17 million barrels from 2008, the U.S. Energy Department said in a report today. Recessions in the world’s largest economies will last for years, dragging down crude-oil demand and prices, BP Plc Chief Executive Officer Tony Hayward said today. China and India will lead the recovery in energy consumption, Hayward said in a presentation at a Houston energy conference sponsored by Cambridge Energy Research Associates. “I believe over the next few years we will see economic growth recover, driven by continued industrialization in China and India and the emergence first of America and then of Europe,” Hayward said. Volume in electronic trading on the exchange was 622,443 contracts as of 3:13 p.m. in New York. Volume totaled 655,316 contracts yesterday, 30 percent higher than the average over the past three months. Open interest yesterday was 1.23 million contracts. The exchange has a one-business-day delay in reporting open interest and full volume data. Feb. 10 (Bloomberg) -- The dollar and yen rose versus most of their major counterparts on bets Treasury Secretary Timothy Geithner’s financial recovery plan will fall short of reviving lending, increasing demand for a haven. The yen advanced more than 6 percent versus the Australian dollar, the biggest intraday gain in more than two months, on speculation investors reduced holdings of higher-yielding assets as Geithner pledged financing for programs that may grow to $2 trillion. The dollar increased for the first time in three days versus a gauge of currencies of six major U.S. trading partners. The dollar gained 0.8 percent to $1.2896 per euro at 4:04 p.m. in New York, from $1.3003 yesterday. The yen strengthened versus the euro for the first time in four days, appreciating 2.2 percent to 116.42 per euro from 118.94. Japan’s currency advanced 1.3 percent to 90.31 per dollar from 91.46. The yen advanced as much as 6.1 percent to 58.46 versus the Australian dollar and 4.5 percent to 130.36 against the pound on speculation losses at financial firms will deepen, encouraging investors to sell higher-yielding assets and pay back low-cost loans in Japan. The Bank of Japan’s 0.1 percent target lending rate compares with 3.25 percent in Australia and 1 percent in the U.K.
Mexico’s peso, Brazil’s real and South Africa’s rand depreciated more than 2 percent against the dollar on reduced demand for emerging-market assets. The peso lost 2.2 percent to 14.5240 versus the dollar, the real declined 2.2 percent to 2.3093 and the rand weakened 2.9 percent to 9.9224. The ICE’s Dollar Index, which tracks the greenback versus the euro, the yen, the pound, the Canadian dollar, the Swedish krona and the Swiss franc, rose 1.2 percent to 85.81 today. It lost 0.8 percent last week in its first weekly drop this year on speculation the bank-rescue plan would reduce demand for the world’s reserve currency. The Australian dollar lost 3.9 percent to 65.20 U.S. cents today after gaining 5.9 percent versus the greenback last week, the biggest rally since the end of October. The Treasury is creating a Public-Private Investment fund, with an initial capacity of $500 billion that could grow to $1 trillion, to provide financing for private investors to buy distressed securities, Geithner said in a speech in Washington. The department will also work with the Federal Reserve to finance as much a $1 trillion in new consumer and business loans. The new Consumer and Business Lending Initiative is modeled on an earlier program to support new credit. The U.S. Senate approved a separate $838 billion economic stimulus package today, clearing the way for negotiations with the House over a compromise plan lawmakers said they want to send to President Barack Obama quickly. The chamber today voted 61-37 to approve the measure. It provides $293 billion in tax cuts and more than a half trillion dollars in new spending that lawmakers call critical to preventing the economy from sinking deeper into recession. U.S. stocks plunged today, with the Standard & Poor’s 500 Index losing 4.9 percent, the most since Obama was inaugurated, on concern the government’s bank rescue won’t work. The euro weakened earlier as much as 1.5 percent versus the dollar after the Nikkei newspaper, citing an interview with Russian Association of Regional Banks head Anatoly Aksakov, reported that Russian banks and businesses may ask foreign lenders to reschedule loans worth $400 billion. The 16-nation euro pared its loss against the greenback after Aksakov told Bloomberg News that banks such as London- based HSBC Holdings Plc suggested meetings with Russian companies concerning their ability to meet obligations. Feb. 9 (Bloomberg) -- The U.S. Energy Department, slow to issue funds in the past, may not be able to handle an estimated $40 billion in new energy spending from the economic stimulus plan, Senator Lisa Murkowski said. Murkowski, the senior Republican on the Energy and Natural Resources Committee, said the new spending would almost double the annual budget of the department, which received $24 billion for the 2008 fiscal year. The department’s inability to provide loans more quickly for carmakers is an example of its “chokepoints,” she said. Instead of counting on the Energy Department, Congress may create a “clean energy bank” to fund such investments, Murkowski said. She said she has been discussing the idea with Senator Jeff Bingaman of New Mexico, the energy panel’s Democratic chairman. Former Senator Pete Domenici, a New Mexico Republican, proposed such legislation last year. The idea could be part of bipartisan energy legislation that may be offered in draft form by the end of May, she said. President Barack Obama said today at a town hall meeting in Elkhart, Indiana, that the stimulus package would provide billions of dollars “for moving us toward a new energy future,” including helping to double the amount of renewable energy produced in three years. The Senate is scheduled to vote today on whether to close debate on the stimulus plan. Murkowski said she opposes the measure. A final vote could come tomorrow, after which the $780 billion measure would have to be reconciled with the House’s version, which totals $819 billion. In addition to delays in the Energy Department’s loan program for more efficient vehicles, first authorized in 2005 legislation, Murkowski cited the lack of action on funds granted in 2007 for “smart grid” technologies to improve transmission- line performance. Energy Secretary Steven Chu, who was sworn in on Jan. 21, said last week that he aims to issue loan guarantees for carmakers and car-part suppliers in one to two months. He also said he wanted to begin funding items proposed in the stimulus within six months of when it becomes law. Murkowski cited a lack of financing expertise in the Energy Department, an idea seconded by Kevin Book, a senior analyst for Friedman Billings Ramsey & Co. in Arlington, Virginia. While the Energy Department is renowned for its research and development of energy technologies, “I wouldn’t go there for a mortgage,” Book said in a phone interview. Murkowksi also said she opposes Bingaman’s plan for a federal requirement that 20 percent of electricity come from renewable sources by 2021. “The 20 percent is going to be problematic,” she said, suggesting the goal should be 15 percent and that nuclear and hydropower facilities should be added to the definition of renewable energy sources. Feb. 9 (Bloomberg) -- Gold fell the most in four weeks on expectations the U.S. Congress will pass a smaller-than-expected stimulus package to revive the economy, easing the risk of accelerating inflation. Silver also declined. The Senate is expected to vote tomorrow on a rescue plan of at least $780 billion. Gold climbed 5 percent in January on demand for a store of value amid a deteriorating economy and a surge in government spending. Investments in exchange-traded funds backed by bullion reached a record, and speculators last week raised bets the price would increase. Gold futures for April delivery fell $21.50, or 2.4 percent, to $892.80 an ounce on the Comex division of the New York Mercantile Exchange, the biggest drop for a most-active contract since Jan. 12. The price climbed 2.4 percent in the previous three sessions. Silver futures for March delivery declined 33 cents, or 2.5 percent, to $12.83 an ounce. Silver has gained 14 percent this year, while gold rose 1 percent. The U.S. House of Representatives last month sent a stimulus package to the Senate valued at $819 billion. Last week, the Senate plan expanded to as much as $900 billion before some Republicans delayed passage of the bill. Gold had climbed on speculation that government spending will spark inflation. Investment in the SPDR Gold Trust, the biggest exchange-traded fund backed by bullion, rose to a record 867.2 metric tons on Feb. 5. Speculative long positions, or bets prices will rise, outnumbered short positions by 155,306 contracts on the Comex in the week ended Feb. 3, Commodity Futures Trading Commission data showed on Feb. 6. Net-long positions rose by 14,192 contracts, or 10 percent, from a week earlier. The drop in gold prices may be a buying opportunity for some investors. Completion of the stimulus package that the Senate is weighing would raise the government’s commitment to solving the financial crisis to $9.7 trillion, according to Bloomberg data. The Federal Reserve, Treasury Department and Federal Deposit Insurance Corporation have lent or spent almost $3 trillion in the past two years and pledged to provide as much as $5.7 trillion more. FKLI February futures contract surge 16 points higher to close 893 as compare to previous trading session with total 5788 lots traded in the market. FKLI was traded higher during trading due strong KLSE trading during the trading session. 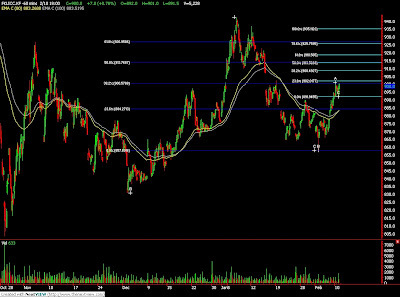 Technically, FKLI seems complete its wave 3 expansion at 123.6 % Fibonacci projection figures at 897 regions. We expect FKLI would retrace mildly toward support region at around 880 and 872 levels; 80 – day and 100 – day moving average. 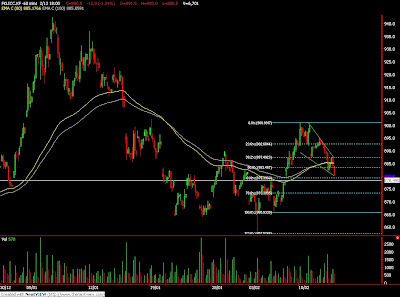 Traders were advice to hold long position in the coming trading session around the support while do take note on the resistance levels at 897 and 927 regions. FCPO 3rd month April Futures contract closed marginally RM1 higher to close RM1880 as compare to previous trading session with 7728 lots traded in the market. CPO price was trade wild due some profit taking activities after 4 consecutive days of bull rally. 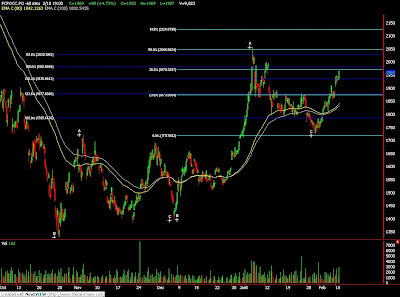 Technically, CPO price seems reached 78.6% Fibonacci projection levels at RM1916 region. We expect CPO price would retrace mildly towards next support levels at RM1800 and RM1840 region in the coming trading session. Traders were advice to hold long position in the coming trading session while be cautious around the resistance levels at RM1920 and RM1950 regions. Feb. 9 (Bloomberg) -- Crude oil traded little changed in New York amid doubts a $780 billion stimulus plan in the U.S. will lead to a rapid recovery in global energy demand. Senate and Congress lawmakers due to vote on the plan today and tomorrow are more than “90 percent” agreed on its contents, Lawrence Summers, director of the National Economic Council, said yesterday. U.S. crude inventories have climbed in 17 of the past 19 weeks, leaving them 15 percent higher than the five-year average for the period, the Energy Department said. Crude oil for March delivery was at $40.06 a barrel, down 11 cents, in after-hours electronic trading on the New York Mercantile Exchange at 10:22 a.m. Singapore time. The contract traded between $38.60 and $42.68 last week and fell 2.4 percent to $40.17 a barrel on Feb. 6. Prices slumped as much as 6.2 percent that day after a report showed unemployment in the U.S. reached its highest since at least 1992. The prospect of further production cuts by the Organization of Petroleum Exporting Countries and strike action in Nigeria, the fifth-largest supplier of oil to the U.S., failed to push crude beyond its recent trading range. New York oil futures have fallen 10 percent this year and are down 73 percent from the record $147.27 reached July 11 as a global recession cuts demand for oil and other commodities. Advanced economies are already in a “depression” and “a lot of downside risk” remains, the International Monetary Fund’s Managing Director Dominique Strauss said Feb. 7 in Kuala Lumpur. Brent crude oil for March settlement was trading 6 cents lower at $46.15 a barrel on London’s ICE Futures Europe exchange at 10:23 a.m. in Singapore. It dropped 0.5 percent to $46.21 on Feb. 6. OPEC pumps about 40 percent of the world’s oil and has cut daily output by 4.2 million barrels since September in a bid to prevent a glut and stem sliding prices. OPEC will likely reduce production again next month in a bid to restore prices to $70 a barrel, Agence France-Presse reported Iraqi Oil Minister Hussain al-Shahristani as saying on Feb. 7. Oil industry managers in Nigeria, OPEC’s seventh-largest producer, are due to start an indefinite strike today to protest attacks and abductions targeting oil installations. Hedge-fund managers and other large speculators decreased their net-long position in New York crude-oil futures in the week ended Feb. 3, according to U.S. Commodity Futures Trading Commission data. Speculative long positions, or bets prices will rise, outnumbered short positions by 29,276 contracts on the New York Mercantile Exchange, the Washington-based commission said in its Commitments of Traders report. Net-long positions fell by 22,376 contracts, or 43 percent, from a week earlier. Feb. 9 (Bloomberg) -- The yen rose for the first time in three days on speculation Japanese exporters bought the currency after it fell to a one-month low against the dollar. The currency also reversed a decline as Asian stocks pared gains, prompting investors to trim holdings of higher-yielding assets funded in yen. The dollar fell on concern a government report this week will show retail sales dropped for a seventh month in January. The pound may fall after the Confederation of British Industry, the U.K.’s biggest business lobby, published a survey that showed 63 percent of U.K. companies said access to credit worsened in the last three months. The yen rose to 91.75 per dollar as of 11:15 a.m. in Tokyo from 91.89 late in New York on Feb. 6. It earlier reached 92.42, the lowest level since Jan. 8. The currency climbed to 118.79 per euro from 118.85. The pound was little changed at $1.4789, and traded at 87.49 pence per euro from 87.52 pence. The Nikkei 225 Stock Average trimmed its advance to 1 percent after rising as much as 2.2 percent. Futures on the Standard & Poor’s 500 Index fell 1 percent. Sales at U.S. retailers probably fell 0.8 percent in January, following a 2.7 percent decline in December, according to a Bloomberg News survey of economists. The Commerce Department will release the report on Feb. 12.